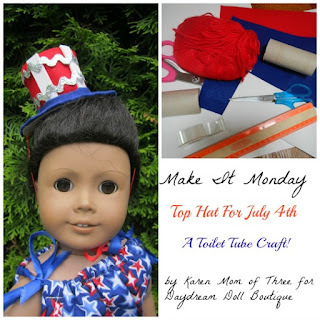 This week I wanted to show you a fun and easy way to make a Top hat for your doll for July 4th. Using items you may already have on hand you can make one for each of your dolls! Step 1- Cut your Toilet Paper Tube in Half. Then use your scissors to snip ½ inch snips around the edge of your tube as shown above. Fold the flaps you created out. 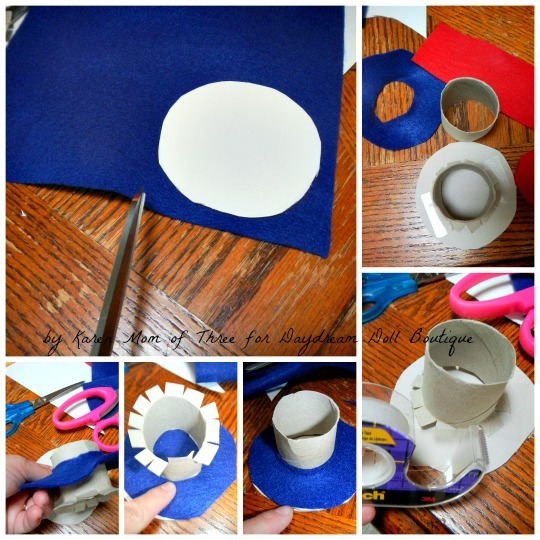 Step 2- Take a piece of cardboard that will become the base of your hat and place the toilet tube in on it as shown in the photos above. Place a juice cup over the top and use your pencil to trace the shape of the cup. Remove the Cup and the tube and cut out your hat base. Step 3- Place your cut out hat base on your blue felt. Cut out a felt circle. Step 4- Trace your toilet paper tube on the center of your felt. Then cut out that center of the felt. Slip the felt over your toilet paper tube to make sure it fits as shown in the photo above. Step 5- Tape your toilet paper tube in the center to secure it. Step 6- Use your toilet paper tube to measure a hat band. Cut out the felt and place it a side. 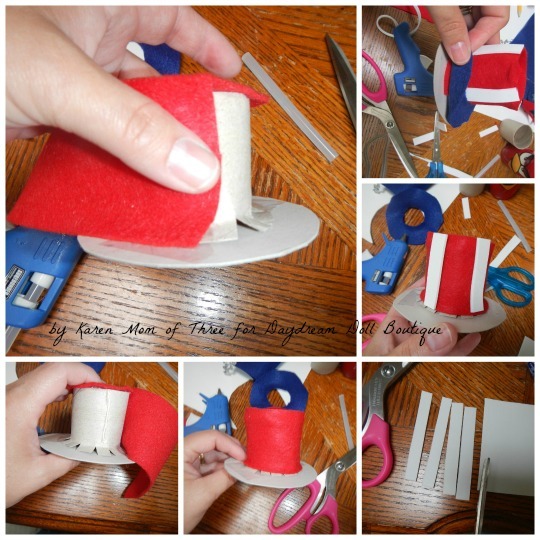 Step 8- Use your glue gun to attach the felt top to the hat. Step 9- Now it is time to assemble your hat. 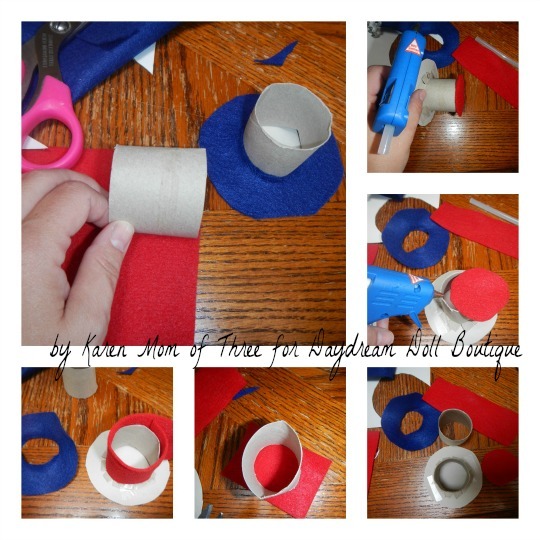 Run a line of glue down the side of your toilet tube hat wall as shown above. Step 10- Continue gluing it into place. Step 11- Cut your white strips from felt or fun foam, I cut mine ½ inch thick and then glue into place along the hat wall as shown. 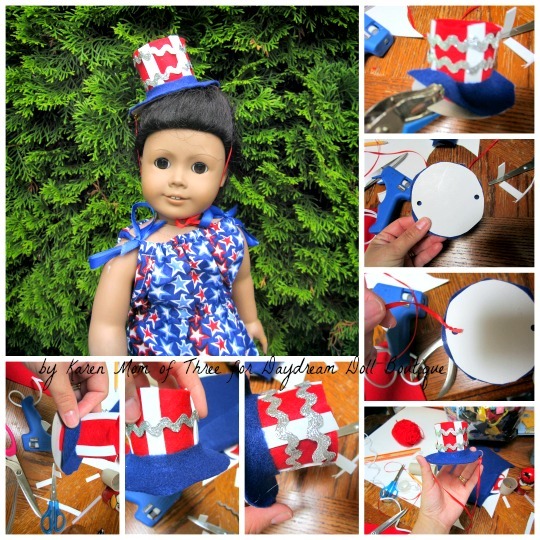 Step 12- Embellish your hat as you wish, I used silver rick rack but you can use stickers or other patriotic items. Then Place the hat brim felt over your hat wall. 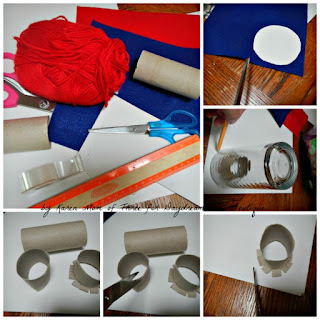 Step 13- Use your hole punch to cut a hole in the cardboard only. Repeat on the opposite side. Step 14- Cut two 15 inch pieces of ribbon or string and tie one on each side through the hole you created, then use the glue dots or more glue from your glue gun to glue the hat brim felt into place. 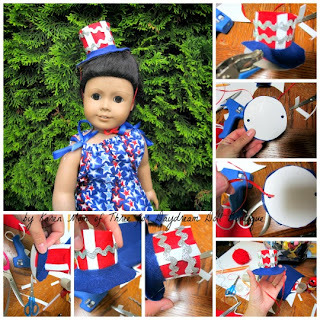 Step 15- tie the hat on your doll and enjoy!